The first thing I want to be clear on is that I don’t have a PHD in deer nutrition or anything. I am just a very avid deer hunter who has put in hundreds if not thousands of hours learning and studying deer minerals and nutrition and how they affect deer. I have however picked the brains of deer vets, biologists and animal nutritionists I have come to know, to get their opinions and thoughts on deer minerals. Even to this day I still learn more how minerals work together and bond with each other in a deer’s body. With that being said, here is what I have discovered and learned about deer minerals and how they affect the deer herd. One of the biggest mistakes or misconceptions made by me and other hunters is that we can just mix dicalcium phosphate, stock salt, selenium and some trace minerals and get a quality mineral. It takes additional minerals and vitamins in the proper ratios for the deer to effectively absorb it and utilize it in the blood stream. For example, if the proper amounts of Vitamin D, A, E and amino acids are not present, the majority of the potential mineral benefits goes out the back end of the deer. Sure they will still eat it, but they don’t really get the benefits from it like a properly calculated mineral blend. I am not going to bash by name any minerals out on the market in this article or recommend any one particular brand. But there are a lot minerals out there that are mostly salt and work good as an attractant but will never help or benefit your deer herd or antler growth. Throughout this article I will give you the information you need to look for in a quality mineral so you can do your research and quickly see which ones are attractants and which ones are beneficial mineral blends. Minerals are inorganic compounds that are found in the earth and get absorbed by plants. Minerals have a lot to do with your resident deer herds’ health and reproduction. Minerals are very important to antler growth but are also very important to does and lactation during fawning season and immune system. Minerals also play a huge part in almost all body functions including skeletal development, stress, digestion, breeding, fetal development, pedicle development, immune system and more. But one important thing deer managers and hunters have to understand is every property has different mineral deficiencies. Natural mineral deposits vary greatly from one property to another even just a short distance away. Even greater mineral variations are found in different parts of the country. 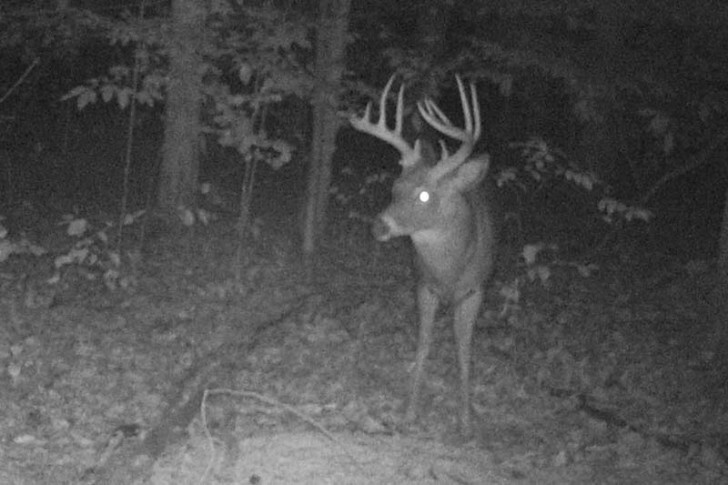 Minerals are just one, but important piece of the equation to growing big bucks. For this article we are just going to list the different minerals and the main ones that effect deer nutrition. Detailing what each mineral does and how they work together to benefit deer is so much info, it would be more fitted for a book and not a article. Plus to be detailed it would need to be written by a specialist. There are two different types of minerals, there are macro minerals and micro minerals. Macro minerals are present in larger amounts in deer or required in larger amounts in their diet. Macro minerals include calcium, chlorine, magnesium, manganese, phosphorus, potassium, sodium, and sulfur. Micro minerals are often referred to as trace minerals, meaning they are present at lower levels in deer or required in smaller amounts in their diet. There are many Micro minerals including aluminum, antimony, arsenic, barium, beryllium, bismuth, boron, bromine, cadmium, carbon, cerium ,cesium, chromium, cobalt, copper, dysprosium, erbium, fluorine, gadolinium, gallium, germanium, gold, hafnium, indium, iodine, iridium, iron, lanthanum, lead, lithium, lutetium, mercury, molybdenum, nickel, niobium, praseodymium, rubidium, ruthenium, samarium, scandium, selenium, silicon, silver, strontium, tantalum, tellurium, thallium, thorium, thulium, tin, titanium, tungsten, vanadium, Ytterbium, Yttrium and zinc. Not all of these micro minerals are essential or even in a deer’s diet. But many of them have a small but important part. The two most essential minerals in deer are the Macro Calcium and Phosphorus minerals. These are essential for bone growth, antler growth, milk production, immune system and overall health. Another major mineral needed is salt but in a limited amount. Deer need sodium during the spring and summer. The reason is deer consume vast amounts of high moisture plants which leads to decreased amount of sodium in their system. Studies have shown that does need twice as much Sodium as bucks do. They believe it is due to the reproduction process. The problem is most mineral blends on the market have way to high of salt ratio. A quality mineral should never have over 30 percent salt. Salt has very little nutritional value to the deer except the balance of sodium do to the high water content forage. Deer will definitely eat these high salt content mineral blends but they offer very little health or nutritional benefits. These should be used more as attractants then a health and growth mineral solution. Too high of a salt intake can actually effect a deers health and antler development. I will discuss that in more detail later in this article. How do deer get minerals naturally? Wild deer get minerals and nutrients from the plants they eat throughout their natural habitat. If the land they browse on has low or missing minerals in the soil, the deer never get the full amount of minerals they need to reach their genetic potential. Pockets of high mineral containing soils are found throughout the country, the deer in these areas get all of the minerals they need through natural plant browsing. In those areas, deer will not utilize or hardly visit mineral sites even if the best mineral is used. Deer somehow know what they need to be healthy and will only eat it if they need it. I have heard countless hunters from the Midwest say, “I tried minerals before and my deer just wouldn’t eat it!” This usually means their particular property has good mineral concentrations and get the majority of the minerals they need from the soil through plant consumption. I personally hunt on a couple of farms that have soils that are high acidic and extremely low in minerals and the deer eat more mineral than you could ever believe, but one farm about a mile down the road the deer won’t hardly touch it. So when making your decision on whether minerals work or not, please consider the availability of natural minerals on the property that you hunt. That has more effect on it, than whether minerals are beneficial or not. In the section above I explained how deer sometimes don’t get enough minerals naturally because of natural mineral levels or lack of minerals in the soil. But in this section I want to explain how deer utilize minerals and how it affects the deer when they don’t get enough minerals. To start the explanation process, I want to compare deer to humans for a minute. Majority of doctors recommend people of all ages to take vitamins and supplements to get all of the dietary needs, we as humans need. Why is that? Basically we have the same problem as deer. Due to our lifestyles, food choices, and the way our food is grown we don’t get enough vitamins and minerals in our diet. Harvested crops only acquire and deliver nutrients that are found in the soil. If the farmer’s field is lacking certain minerals when the food is processed and consumed it also lacks those minerals. Ok, back to deer! Both does and bucks store minerals (mostly Calcium & Phosphorus) by depositing them into their skeletal system to be used later when high demands for minerals are needed. Then during certain times of the year, their body will actually pull these minerals from their skeletal system and use them when needed. During the times a deer needs large quantities of mineral, the thyroid gland of the deer produces a hormone called Calcitonin, which steals or pulls the minerals (mostly Calcium and Phosphorus) back out of the skeletal system and into the bloodstream, making it available for body functions again. This process is similar to osteoporosis, but is only temporary and the bone density will return to normal once antlers harden. The stored sources of phosphorus and calcium can only provide a small portion that is needed for a buck to reach full potential. The buck must get the rest of the minerals and all of the protein needed from its food intake. To effectively explain how minerals affect deer and their health I feel it is necessary to separate the ways does and bucks utilize minerals differently and for different purposes. Although most hunters are only concerned about antler development and how mineral helps them get bigger bucks, the doe herd plays a major role, if not bigger when it comes to bucks reaching their potential. So let’s start with the doe herd. How does a doe eating mineral, help you get bigger bucks? 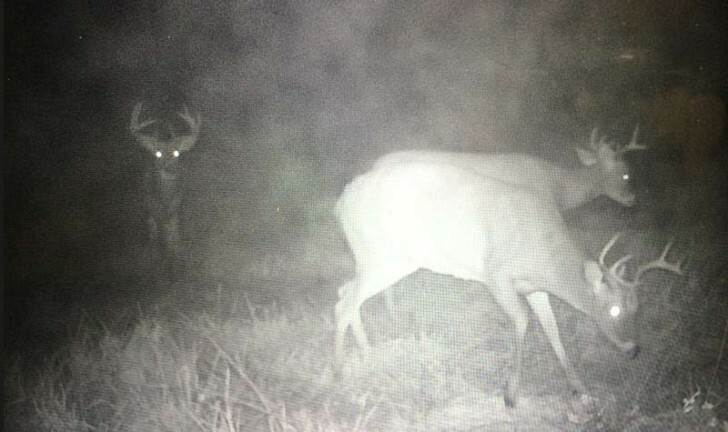 When it comes to deer management, controlling the doe population is the most talked about aspect when it comes to does. But if a hunter or land manager wants his bucks to reach full potential it all starts with the does’ nutrition. During the yearly cycle of a doe, the most important part of the year is during the pregnancy stage. Her body is getting ready to carry and deliver her fawns and she is focusing on nutrition to get back in shape after the hard winter. Once fawns are born her focus is still on nutrition for producing enough milk to feed her fawns. Winter plays a heavy toll on the health of the deer herd, especially in the Northern regions of the country. Deep snow, cold temperatures and scarce food lead to very lean deer by the time spring comes. Her excess mineral reserves have been pulled from her body, depleting any extra minerals she had stored in her skeletal system. Her fawns have been developing inside her all winter adding an additional toll on her body. So during spring, the does priority is to get her weight back up and get stocked back up with minerals. Farms with a high mineral content, allow does to get their mineral intake back up to good levels in spring through eating the fresh new green plants. But within areas with low or missing minerals does never get anywhere near close to receiving the amount of minerals their own body needs, much less what the unborn fawns need. Most deer herds are mineral deficient year round, but especially during late winter and early spring. 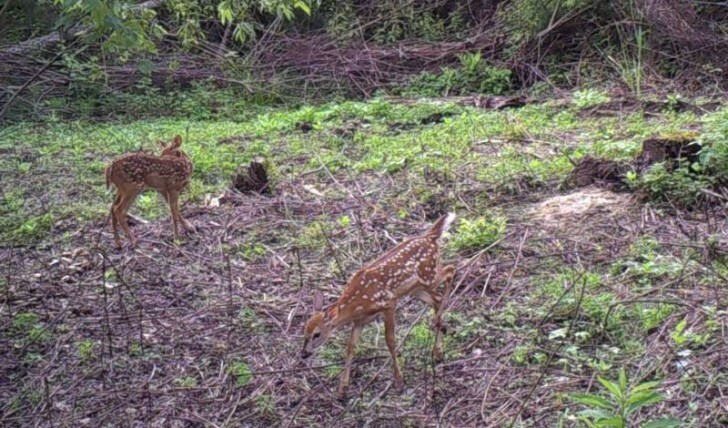 So the unborn fawns have had a mineral deficiency from the time they were conceived. By using supplemental minerals year around or especially from January to August provides your does and your unborn bucks all the minerals they need from the time they are conceived. Once the fawns are born their mother’s milk still delivers all of the minerals they need to grow and develop to their full potential. How can we expect our bucks to reach full body and antler potential when they are mineral deficient from the time they are born? On most of my farms does will visit my mineral sites 3 to 4 times within a 24 hour period. I have noticed by trail camera observation, does with good minerals seem to produce milk for longer, than does that have not had minerals. The other noticeable benefits are larger fawn body size and better overall health. Several studies have shown that bucks born from does with good mineral reserves that have bigger pedicles and larger blood vessels and deliver more nutrients. The more protein and minerals getting delivered while the pedicles are developing leads to larger and stronger pedicles. When a buck fawn gets to be about 4 months old, the buck starts getting increased testosterone levels which starts the development of his pedicles which causes the bumps on his head, that hunters in the late fall call, a button buck. The bumps are not actually antlers yet, but the development of his pedicles. So having access to as much needed minerals through his mother’s milk at this time is extremely important. . So making sure your does have good mineral availability makes a big difference in the health and growth of your new buck fawns. I will explain more how this helps your bucks’ reach full potential as he gets older in the next section regarding bucks & minerals. Minerals help bucks to reach their full antler potential! As I mentioned above, how can we expect our bucks to reach their full potential when they are mineral deficient from the time they are conceived. Calciu m and Phosphorus play a major role in antler development. But for bucks to utilize those two main minerals they also need additional minerals and vitamins in proper amounts to be able to process and absorb minerals and actually get benefit from it. Back to a human comparison, if you have a person that grows up in a household that is big on healthy eating and vitamins since they was born and compare them to someone who hasn’t had a good diet, minerals and good nutritional habits there is usually a big difference in their physical appearance and health. Almost always the one with good nutrition will be healthier and stronger and probably better at physical activities and not sick as much. The first year of a bucks life most of the nutrients and minerals go to developing the skeletal system. The bucks’ skeletal system has to be fully developed before any nutrients will be stored or used for antler growth. So if the bucks gets all the minerals he needs for his skeletal system he can start storing minerals for his future antler growth. Again studies have shown when bucks get the necessary minerals they will usually gain mass, additional points and stickers. Many biologist believe that mature bucks with short stubby points located farther out on main beams are usually a result of the buck running out of protein and minerals during the antler growing period. Once a buck’s skeletal system is fully developed around the age of three, all of the extra minerals consumed and stored in the skeletal system goes toward antler development. This is why there is usually a significant jump in antler growth at this time. Antlers are the fastest growing tissue in the world which creates a extreme demand for minerals and nutrients during the antler growing process. A deer’s normal dietary intake cannot deliver enough nutrients and minerals to support the extremely rapid antler growth. This is where the stored minerals in the deer’s skeletal system gets pulled and delivered to the growing antlers over the 4 month growing period. 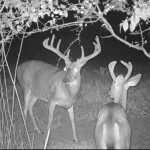 The stored sources of phosphorus and calcium are only a small portion that is needed for a buck to reach full potential regarding antler growth. So if a buck has access to quality minerals throughout the year, he can keep his skeletal system full and intake as much as his body needs during the actual antler growing season. This is why mineral programs can lead to an increase in antler growth. When a buck has all of the mineral he needs from the time he was born until he matures, gives him a huge advantage in reaching his full potential. After several years of steady mineral use I notice a lot of bucks having extra stickers or split tines, these traits typically wasn’t seen on these farms. When it comes to mineral, every buck seems to be different when it comes to the amount of times they visit a mineral site. I figured over time I would see a pattern of younger bucks using mineral sites more than older bucks or vice versa. But I haven’t been able to honestly notice a difference. Most bucks during the growing season visit my mineral sites quite regularly, sometimes up to three or four times with in a twenty four hour period. When bucks start turning hard horned and separating from the bachelor group, there patterns start changing. I usually stop getting as many pictures of them at the mineral sites around the food sources and more in my remote mineral areas around smaller food sources. Mineral makes deer antlers less brittle! The other thing I have observed over the last three years is how minerals makes antlers stronger and less brittle. I picked up a new farm a few years ago after deer season was already in. I didn’t get to put out minerals during the antler growing season. I seen quite a few good bucks but almost every buck on the farm had broken tines and a few had beams completely broken off. It wasn’t just a few bucks but almost every buck on the farm had tines broken off to the point by November, I didn’t want to harvest any of them. 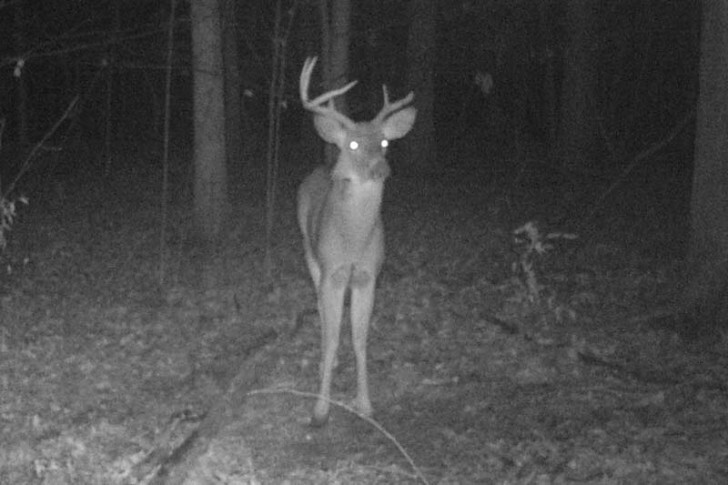 After talking to some neighboring hunters and property owners over the summer, they said it is like that every year because the bucks just fight a lot here! I didn’t think much about it except that if I was going to shoot a buck off that farm I was going to have to do it in the early season. The next year, I started my mineral routine in January and watched many bucks grow over the summer. 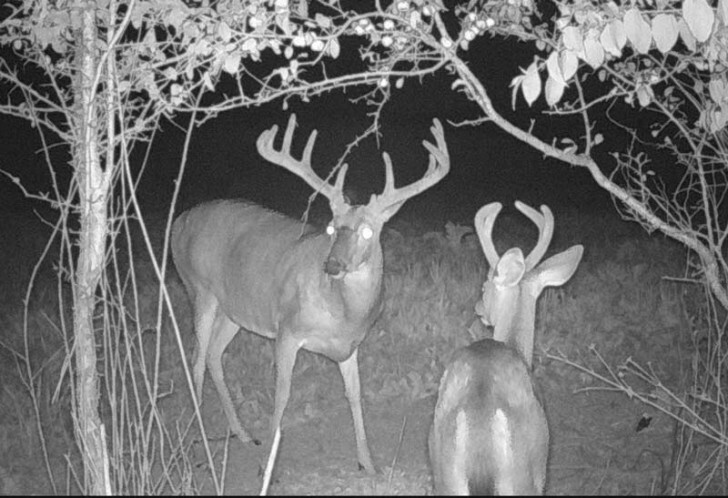 Closer to late summer, I began noticing the bucks in velvet started showing kickers and split tines, like deer on my other farms. To make a long story short, by end of that hunting season I noticed that all of the bucks I watched eat mineral all summer on camera never got busted up. Even the thin long sticker points on several of them never broke off. But earlier during the rut, I started getting pictures of new bucks I never seen before, and their racks was busted up like I seen the year before. I quickly realized the mineral was making the racks stronger and less brittle. I later learned that minerals make a big difference in the density and hardness of antlers. Since then I have had a lot of hunters tell me they notice the difference after starting a quality mineral regiment. So if you have a farm where you see a lot of bucks with busted tines, it’s a good sign your area is deficient in one or several minerals. Too much salt can actually have negative effects for deer health and antler growth! Several studies have shown that steady consumption of salt can have negative effects on deer’s health. Deer have a tendency to eat too much salt or become slightly addicted to it compared to other minerals. The problem is the more salt they eat or acquire, the more water they consume because of thirst. The issue then is all the extra water consumption fills their stomachs and decrease the feeling of needing to eat. So instead of eating and filling their stomachs with high protein forage they feel content and actually don’t eat as much because of the full feeling. 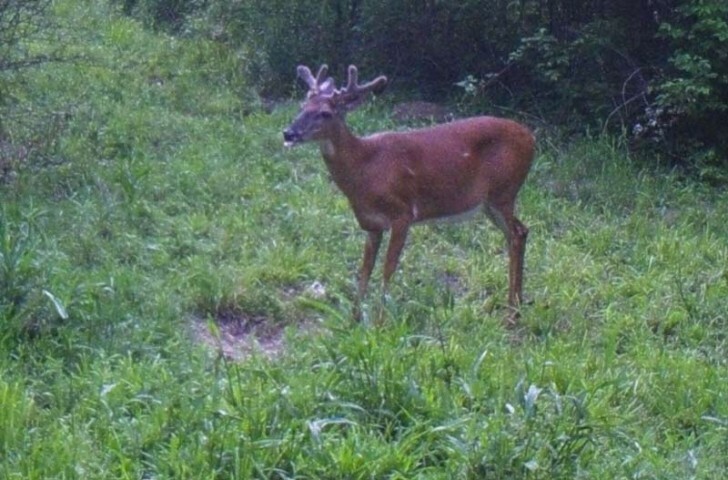 This happening over the course of spring and summer can greatly decrease the amount of protein a deer takes in, which can directly affect a buck’s antler growth. As I have mentioned before I have been guilty of making homemade mineral blends. But after researching it for years and really learning how the minerals work together, I quickly realized my blend was missing a lot of important ingredients and the proper ratios of the different minerals and vitamins. Although the deer was eating my mineral I learned the deer was probably not digesting much of it or getting much benefit from it. Plus I was probably actually hindering antler growth in my bucks some because of the amount of salt and the extra water intake. To be honest, I make my own blends of mineral for my personal use and sell it to some close friends, but due to the complexity of the ingredients and mixing required, I have to get it mixed by a feed company. When to use deer minerals! Deer need and utilize minerals the most from January through August during the antler and fawning season. I personally keep mineral out year round to help keep my deer herd in the best condition possible. The other times of the year they don’t eat it as much, but I still get pictures of them stopping by every once in a while getting a mouth full of mineral. Where and how to use minerals! When it comes to mineral placement I place minerals in many different locations on my farms based on spring, summer, fall, winter food and bedding patterns. The reason I do this I have to get my does and bucks to eat it to get them to benefit from it. If my mineral is not conveniently located where they are spending most of their time feeding during antler growing and fawning stages, they will not utilize it enough to make a difference. Plus, not all of my does and bucks are in the same parts of my farm at all times of the year. I mainly target my spring and summer food sources because that is where the deer will be while raising the fawns and antler development and need it and utilize mineral the most. On new farms with big agricultural fields I will usually have three or four mineral sites around each field if it is planted in beans, alfalfa or some other main spring and summer food source. If the field is in corn or another non target crop I will only have one mineral site somewhere on the edge of the most used area of the field. I also always have one mineral site in every food plot on my farms. If you’re also supplemental feeding, you should have mineral at each location, this is a great way to target your does. 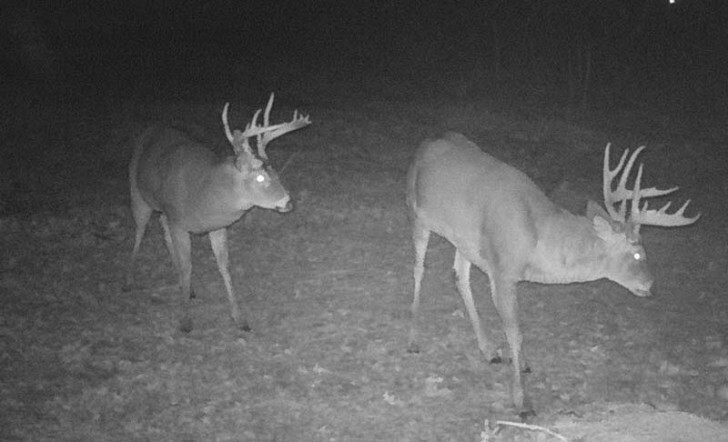 But in my personal experience big mature bucks have a tendency to not visit feeders unless they have grown up on the farm and have been around them all of their life. On several farms where I supplemental feed, I get pictures of bucks on mineral around other food sources that I never get a pictures of around a feeding site. I always have cameras on my mineral sites to take inventory of my bucks I have that year. The other thing I use the cameras for is to tell me which mineral sites are being used the most. If I am getting all of the same bucks and does at each mineral site I will choose one and discontinue the use of the other locations. 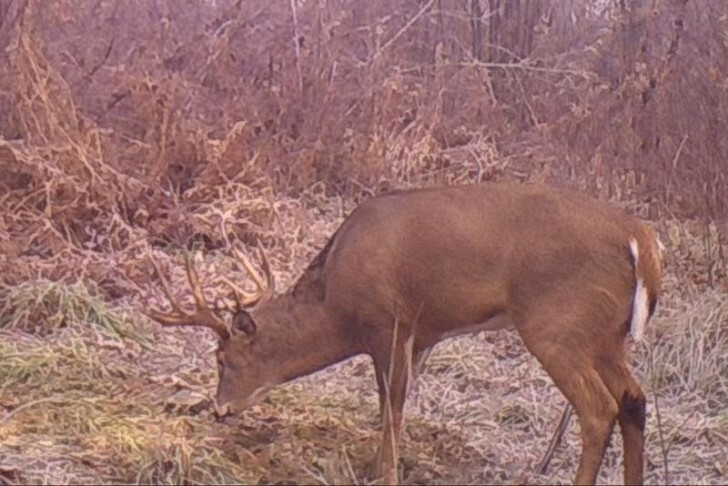 Mineral sites are a great way to get close pictures of your bucks and watch them grow. This part of the article I saved for last because what I am about to say is going to be opposite of what most mineral companies tell you to do and how most hunters have been using minerals in the past. I am sure I am going to get a ton of comments and emails arguing this part of it. Everyone has their way, I am not saying my way is the best or the right way, but just letting you know what I have learned and what has worked best for me over the years and how I do it. Over the years talking to biologists, large animal vets, and people who raise deer I quickly learned I wasn’t using mineral the right way. As one vet told me, “If your deer are digging they are not getting as much mineral as they need.” So I started experimenting with how I placed my mineral and started keeping a journal of how the deer reacted and how much they visited it and how long they stayed at the site. I placed mineral on rotting stumps, dug holes and mixed in into the soil and placed it in a pile on top of the ground. First I want to say I was using a quality mineral with low salt content. Salt based minerals dissolve into the soil after a good soaking rain. I guess that is why they tell you to go and mix it and make them eat dirt with it. A quality mineral will not dissolve away and will stay on top of the ground until it is eaten. What I quickly learned is when deer have a choice, they chose almost every time to just take a big mouthfuls of mineral sitting in a pile on top of the ground. They visited these sites way more often, they came and ate just a few ounces at a time then moved on. The other thing I realized was by letting them just grab a mouthful it allowed other deer to come in and get some at the same time. To test it further, I placed mineral side by side in three different locations. In each location I just dumped the mineral in a pile, and dug a hole and poured it in and mixed it with the dirt. All within five feet of each other. I checked cameras after a week, and it was shocking how much the deer preferred to eat out of a pile of mineral over the hole. The only time I really had deer eating out of the hole was when the mineral in other spot was completely gone. My end results showed, when mineral was readily available on top of the ground, the deer visited the site more often. Just the amount of mineral they was actually consuming was surprising. When they can actually get mouthfuls of mineral instead of digging and eating dirt they use it a lot more. How much mineral should I use? The next question I always get is how much mineral should I use? I can’t really answer that for you. It depends on your deer density and the mineral situation on that farm. The deer will tell you how much they need. I start out with about 10 pounds in each location. Then when I check my cameras in a week I see how long it lasted. I personally try to only put enough out to hold them until my next visit. That helps keep the mineral fresh and I think it makes a big difference. As I mentioned before, some farms have good levels of minerals in the soil and the deer won’t hardly touch it. The next farm might have big mineral deficiencies and it is unbelievable how much mineral they need. But I will say the farms where they eat it the most is the place where you will see the biggest difference in your bucks. I hope this article has helped people understand minerals more and how they help your deer herd. If you have any questions go to the Deer Mineral Section in the forums and ask away.